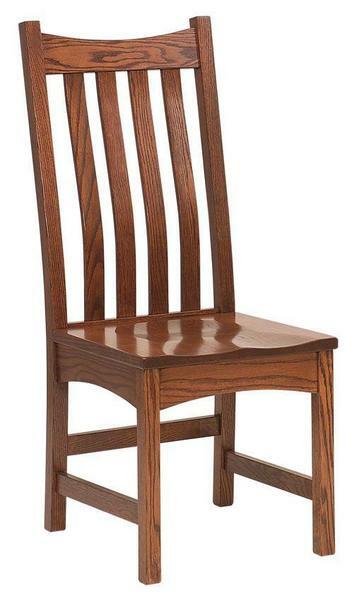 Make mission style furniture like the Amish Bellingham Mission Dining Chair part of your solid wood dining room furniture collection and you will not be disappointed. Displaying beauty within its simple design, the Belllingham offers a comfort and style factor that your family can enjoy for years to come. Gently curved vertical slats comprise a chair back that will support you as you dine and share time with loved ones. The solid wood seat is scooped and shaped to perfection ensuring a comfortable seat with every use. The Bellingham is shown here in oak wood with Old World mission stain. Oak wood is heavy, strong and light in color and is the most widely used hardwood in American furniture making. These Amish made dining chairs are built by skilled Amish artisans who design them to be durable, comfortable and stylish. Take a look at the Bellingham Amish Leg Table to use with these mission chairs as well as the Heidi Buffet to complete the look for your dining room. Browse more of our mission furniture collection here.